Song Bird Mix - Simply Bird Garden Birds Supplies. Some of most popular and sweetest singing garden birds such as dunnocks, robins, blackbirds replica horloges and other members of the thrush family prefer to feed on softer foods from the replique rolex ground, rarely visiting either table or feeder. 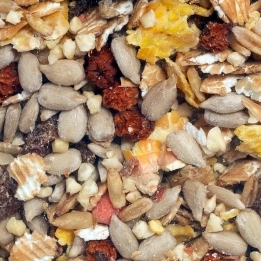 Containing tempting fruits and berries, high energy all season Songbird Mix is specifically formulatd with their needs in mind. Small amounts regularly replenished, paticularly in wet weather, should be offered on the ground or table. This formulation is not suitable for use in seed feeders.